The IRS recently announced they sent at least 362,000 names to the State Department to deny or revoke the US passport for those US Citizens who have not paid their taxes. The Internal Revenue Code allows the IRS to certify the tax debt of delinquent US taxpayer to the State Department. Following such notification, the State Department, the government agency overseeing passport applications, will not issue or renew the passport of the delinquent taxpayer. “Seriously delinquent tax debt” is an unpaid, legally enforceable, federal tax liability of an individual “greater than $50,000,” adjusted annually for inflation. For 2018 this amount is $51,000. Tax debt includes additional amounts due for interest and penalties. If you have a debt over $51,000 but have made steps to remedy the situation, for example, setting up an instalment plan with the IRS, the IRS is not likely to proceed with notification to the State Department. There are other exemptions where a US passport holder will not be under risk, such as if they are bankrupt, within a federally declared disaster zone or because they have made a request for innocent spouse relief. 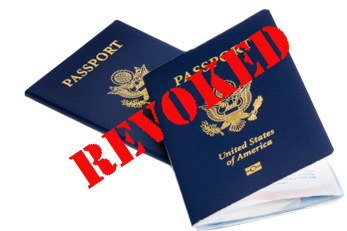 If the US Citizen is living overseas, and the passport is revoked, the State Department can issue the taxpayer with a limited passport, allowing them to return to the US only. It is now reasonably well known that the Foreign Account Tax Compliance Act (FATCA) requires all non-US financial institutions to identify US persons who are customers and to send their identities to the US Treasury. It also requires individuals to report their non-US financial assets to the IRS annually, if they are above certain thresholds. With the US government getting more information on all their citizens, whether living domestically or abroad, they are more easily able to identify those who have not filed and have a significant delinquent tax debt. Pay the tax. This is the overall goal of the IRS, to receive the amount they deemed owed to them. According to the Wall Street Journal, one person paid $1million in overdue tax to avoid having their passport denied. Streamlined Procedure: If you have recently realised that you have not complied with your US tax obligations but had no knowledge that you were not compliant, the Streamlined Filing Procedure may provide you with the option to catch up with your US tax obligations and pay the US tax due, thus avoiding having your passport revoked. This process must be started before the IRS has identified you as a non-filer. Contact us for additional advice on US tax compliance.